It's been noted throughout this cycle that Abbott's polling numbers have been consistently better than Cruz's. Obviously, a lot has been written about Republicans crossing over for Bobby Francis. In whatever "x" percentage they might be, those people do exist. But we suspect they're only part of the story. The only way these numbers make sense is if there are also a significant number of Democrats voting for Abbott. Abbott's numbers are too high to explain any other way. What else makes sense?!? Case in point: Yesterday the Dallas CBS affiliate released a poll that had Cruz up by 10...and Abbott up by 26. Cruz's +10 is fairly normal for a Republican in a statewide race. Indeed, the rest of the Republican ticket had numbers within a similar range as Cruz. But there's no way Abbott gets to +26 without significant cross-party support. Bottom Line: There's a chance Cruz underperforms the rest of the Republican ticket, but there's an equal or greater chance that Abbott overperforms it. 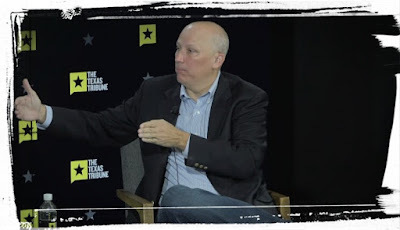 A time for every purpose under heaven"
Obviously, this Bonnen thing seems to be gaining momentum. Beyond what we said yesterday, we don't know what to make of it. Only time will tell. But before we go any further, it's time to discuss something about which we've been thinking for several months: We need term limits on the speaker. Regardless of the next speaker's identity, they should be limited to three sessions. History shows that allowing speakers to continue past three terms is dangerous. Joe Straus was never good on policy, but during the early days he kept the abusive lawlessness to a minimum. Gib Lewis became mired in scandal during his fifth session. Tom Craddick became known as "auto-Craddick" during his third. Furthermore, the best time to push for this reform is during a vacancy. Regardless of the next speaker's identity, there are going to be members disappointed by the outcome. One would think they would like another shot in a few years. Finally, term limits for the speaker could only help to decentralize power away from the speaker's office. Bottom Line: An open seat race is the best time to advance this process reform that should have been adopted a long time ago. Here's the thing: Dennis Bonnen is a man of many, many, flaws. 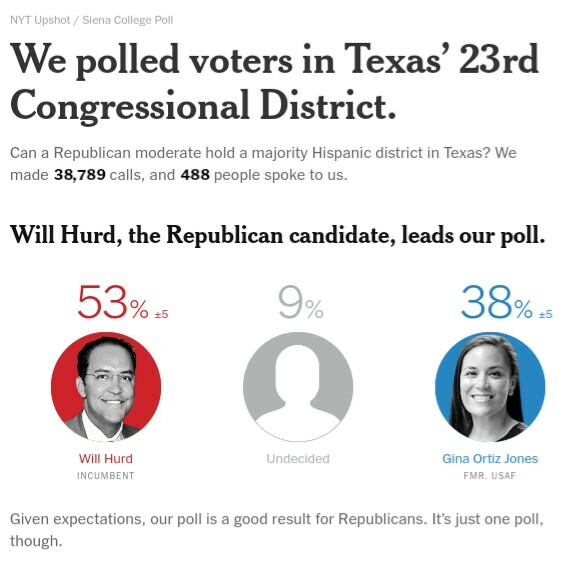 But he would still represent a tangible upgrade over Joe Straus. 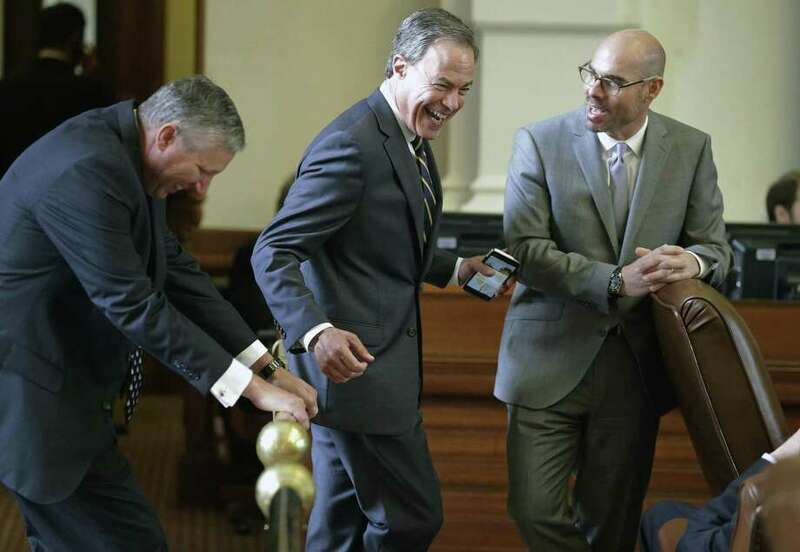 Amazing as it may sound, Dennis Bonnen had a higher Empower Texans score last session than any of the declared speaker candidates. 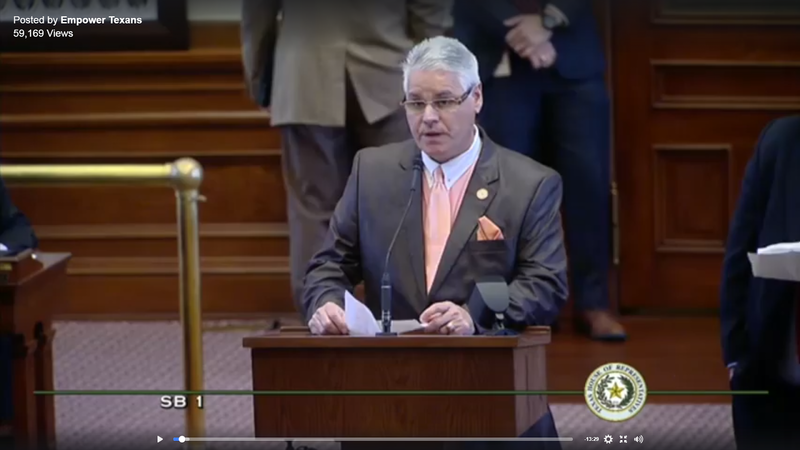 At a minimum, you probably get some kind of property tax reform out of a Bonnen-led house. 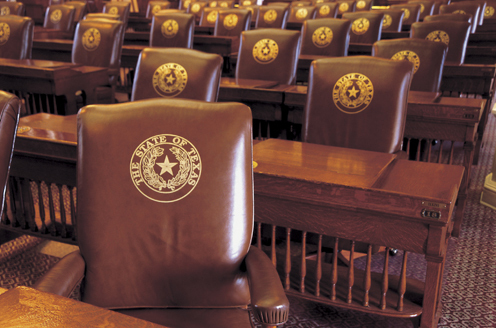 Obviously, Dennis Bonnen was the public face of killing property tax reform last session. 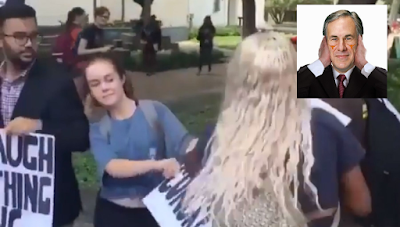 But, according to multiple Capitol sources, Bonnen wasn't happy about it. 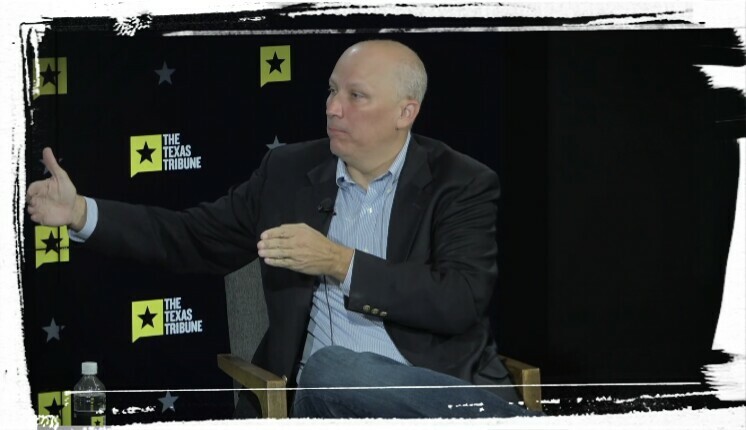 Bonnen was basically placed in an impossible situation by Joe Straus, but he did his best to muddle through. We've also heard rumors, though they are unconfirmed, that Bonnen was one of the major players in getting Joe Straus to finally step aside. Bottom Line: We can probably do better, but we can certainly do worse. We had originally intended to rip on Jimmy for going to this event in the middle of the workday despite this ongoing water DEBACLE. But clicking through the Statesman link, it doesn't appear that he was there. So no harm, no foul, towards Jimmy (on this topic). But this does beg another question: What the heck are the WillCo Democrats thinking?!? It's not a secret that people can't stand being lectured about politics by celebrities. Yet that's how WillCo D's choose to present themselves. If you're wondering why John Carter will (probably) survive the midterm, this is a good example of why. Y'all do realize this district includes Bell County, right?!? "For they bind heavy burdens, hard to bear, and lay them on men’s shoulders; but they themselves will not move them with one of their fingers." In other words, taxpayers elsewhere in Texas and the United States are going to be expected to pick up the tab for this 100% local failure. This is coming from the same Mayor who has prioritized regulating Uber to death, inventing municipal entitlements, and boondoggle soccer stadiums over basic infrastructure. But now Steve Adler wants the state of Texas and the Feds to pick of the cost of this debacle. 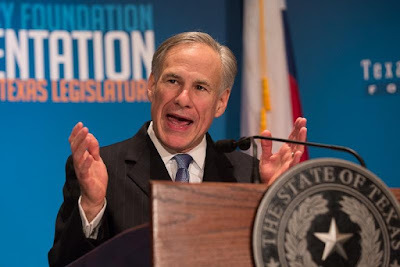 To the extent that they can do so legally, both Greg Abbott and Donald Trump should tell Adler to pound sand. Bottom Line: This one's on us. This failure's 100% local. The state and the feds owe us nothing. Darn that Trump for the totally inadequate management of Austin's municipal water system. Clear evidence of racism on his part and on the part of the patriarchal republican leadership of Texas. "You shall not circulate a false report. Do not put your hand with the wicked to be an unrighteous witness." Nothing in this allegation requires an ELEVEN MONTH investigation. All they have to do is determine of the alleged photo actually comes from a phone of which Charles Schwertner ever had possession. Frankly, there's no reason this investigation should have already been completed. "The things which you learned and received and heard and saw in me, these do, and the God of peace will be with you." During both the primary, and the runoff, this website criticized Chip Roy's messaging. He wasn't necessarily doing anything wrong, but his rhetoric was cliched and stale. That has changed. A Politico interview and a Trib appearance yesterday illustrate Roy's growth. Most important, Roy is finally connecting abstract conservative principles with people's day-to-day lives. We'll focus on the Trib appearance because there's video (and because we're partial to in-state media). Health Care is the issue where Roy's growth is most evident. He's now promoting "health care freedom" instead of "repealing Obamacare." That's important because fixing the health care system will galvanize the public in a way that returning to the pre-2010 status quo won't. Roy explains: "If you're going to own something, you have to solve the problem." The uninspiring 2017 health care bills didn't do so. Furthermore, "if you don't cause costs to go down, it's not going to work." The primary way to accomplish this objective is to remove bureaucrats while increasing Doctors and other medical professionals. Policy details can follow, but the problem is (finally) properly defined. To his credit, Roy also calls BS on the so-called 'pre-existing condition' ruse. Specifically, Roy explained yesterday government created that problem. Roy refuses to be bullied about the national debt. Specifically, when asked about it, Roy blames FEDERAL SPENDING not insufficient taxation. Roy also has the political courage to explain that you can't address the national debt without addressing Medicare and Social Security. On immigration/border issues, Roy is now discussing them with the complexity they deserve, rather than earlier platitudes about "opposing amnesty." But he who is perverse in his ways despises Him." i mean a handful of apples is two apples. a handful of skittles is 25. a handful of water boil days is ___________??????? Here's the thing: Municipal Utilities are 100% within the jurisdiction of the legislature. We're not sure what they should do. Several possibilities exist. They should start with basic financial accountability. Another issue worth considering: There were drinking water related issues during Harvey. Obviously, Harvey was a much bigger storm, and a much better reason for drinking water issues to exist. 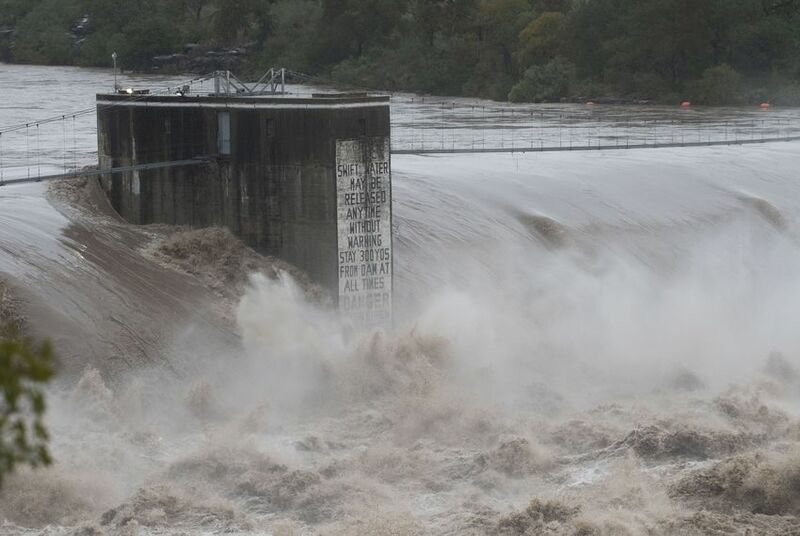 But, aside from accountability for Austin Water's DEBACLE, there might also be a case to act of the grounds of emergency preparedness. 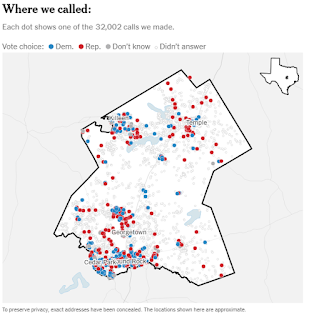 But that's not to minimize the case for holding Austin Water accountable for this breakdown. Last night's debate was a bad sequel. Both candidates regressed to stale talking points. Following a solid opening act, the (likely) final debate was a depressing example of two people talking past each other. Both get a "C."
Of course, a debate where the candidates hold serve benefits the status quo. Obviously, Cruz is winning. In that sense, Cruz accomplished everything he had to accomplish. Debt -- Perhaps the funniest part of the debate was Bobby Francis pretending to care about the national debt. Apparently, for Bobby Francis, the national debt justifies an inefficient tax code. Bobby Francis repeatedly cited the national debt as a reason to oppose the modest tax code streamlining that Congress passed last year. 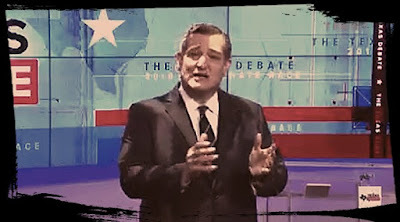 Cruz responded by talking about the relationship between economic growth and federal revenue. Specifically, he discussed how a more efficient tax code leads to more revenue. He's not wrong. But it's still a complicated argument the average voter doesn't understand. Imagine, instead, if Cruz said the following: "The reason we have a $21 Trillion debt is not because the American people are taxed too little. The reason we have a $21 Trillion national debt is because the Federal Government SPENDS TOO MUCH. As a United States Senator, NOBODY has fought to curtail federal spending harder than I have. Unfortunately, too many of my colleagues (in both parties) see it differently. 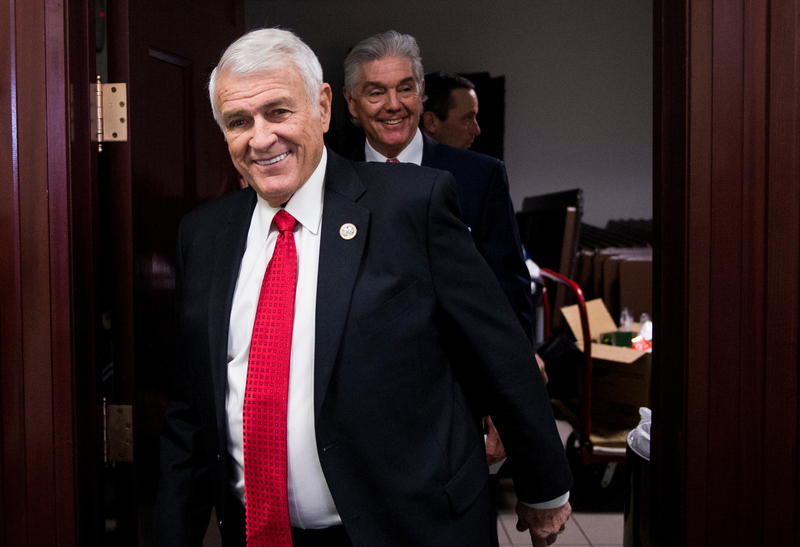 While that is an unfortunate reality, nothing good can come from turning a United States Senate seat over to a Congressman who never met a spending bill he didn't like." From a policy perspective, such an answer would also account for the fact that government spending stifles economic growth. 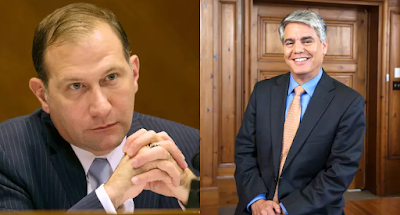 Health Care -- Cruz did an acceptable job pointing out the shortcomings of Bobby Francis' positions, but he continues to underperform on this issue. Bobby Francis supports government run health care. Cruz correctly discussed the cost and inevitable rationing of such folly. Cruz even, correctly, brought up the British National Health Service. But imagine what could have happened if Cruz had forced Bobby Francis to defend what the British NHS did to Baby Alfie. Finally, Cruz would have been wise to contrast the opportunities offered by free-market health care vs. Bobby Francis' socialist nightmare. #MeToo -- How many times do we have to repeat it?!? BOBBY. FRANCIS. O'ROURKE. HELD. A. CAMPAIGN. EVENT. WITH. BORRIS. MILES. Imagine if, in addition to the answer he gave, Cruz had contrasted how the Texas GOP dealt with Barton/Farenthold with how the D's (incl. Bobby Francis) dealt with Miles/Uresti. Cruz's answer was fine, but this could have been a knockout blow. Missed opportunity. The worst part is that he was asked a direct question. Bottom Line: It was fine, but it could have been much more. The head of the University of Texas System's governing board, Sara Martinez Tucker, has told high-ranking UT officials she plans to step down as a regent on Jan. 15, 2019. No reason was immediately given for her sudden departure. The announcement was confirmed to The Texas Tribune by two sources. It's impossible to know what to make of this development. Tucker has been board chair for barely a year. 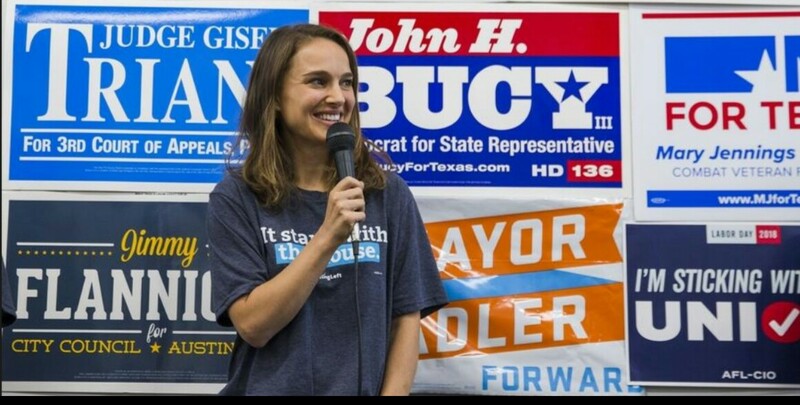 She got the position when Governor Abbott forced out her predecessor. Tucker has always been thought of as close to Abbott. The simplest explanation would be that a new personal or professional development precludes Tucker from finishing her term. If Tucker has a new job or a sick relative, that could explain a lot. However, if that were the case, one would think such an explanation would accompany the announcement. It's not a secret that the University has been embroiled in controversy, but Tucker seems like a strange head to roll (at least without others). Regardless of why, this is an opportunity. Governor Abbott now has to appoint four new regents next spring. For citizens and legislators concerned with the direction of higher education, this is the point of maximum leverage. 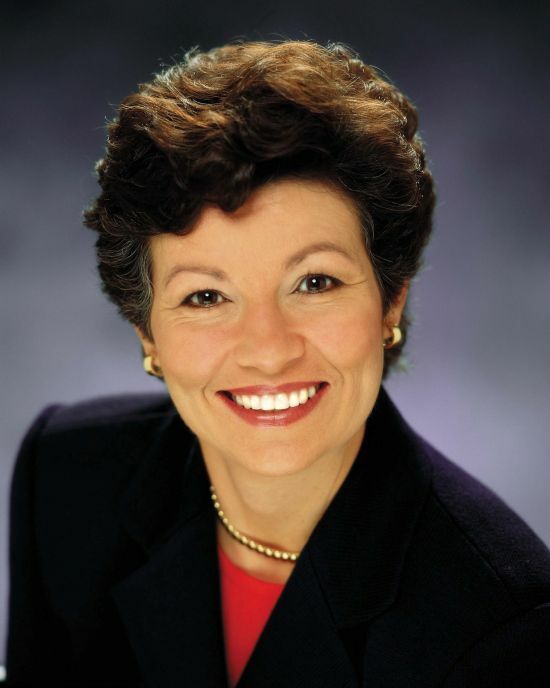 one of only 48 members of Congress to boycott the address of the Prime Minister of Israel to a joint session of Congress. You can learn more about the well documented anti-Semitism of the Iranian government here. Ramsey goes on to make standard arguments about the state "shifting the burden" of school finance onto local taxpayers. 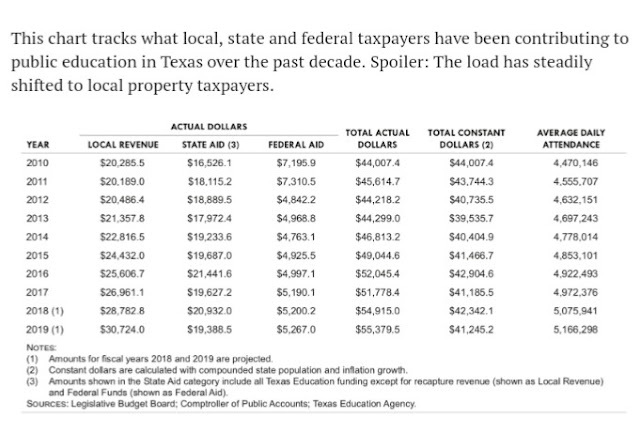 In other words, while it's true that local property taxes account for a higher percentage of total education spending, that spending is not being used to benefit children. Instead, the local ISD's are using local property taxes to hire bureaucrats. That's where all the money is going. In the 2015-16 school year, for example, Texans spent $12,257 per student, with a standard classroom of 20 students receiving roughly $245,000. But teachers – the biggest factor in the quality of education – received only 21 percent of that per-classroom expenditure. The average teacher salary was $51,891. Where did the money go? In large part, it went to administration. Since 1993, the number of students in Texas has increased by 48 percent, while the number of staff has increased by 61 percent. Yet the number of administrators and other staff employees, not including teachers, has increased by 66 percent. 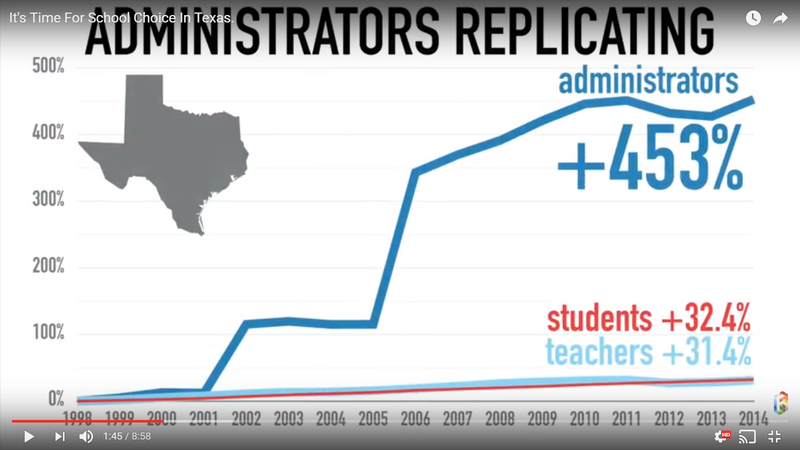 Our public schools grew rapidly, but their administrations grew more rapidly still. One study shows that if school districts had kept the growth of non-teaching staff to the same rate as the increase in students, Texas' public education system could have saved $2.2 billion annually or increased each teacher's benefits by $6,318. Of course, that's also why we recently discussed necessary pre-conditions for any increase in state level education funding. Bottom Line: "Shifting the burden" of education spending back to the state might make sense. But the money needs to go to the classroom. It would be nice if the Trib could make that distinction. And he sins who hastens with his feet." A date that could have marked the end for Major League Soccer coming to Austin will come and go without much commotion. Lawyers from Precourt Sports Ventures and the city of Austin are still drafting the final lease and development contract for a Major League Soccer stadium at McKalla Place. 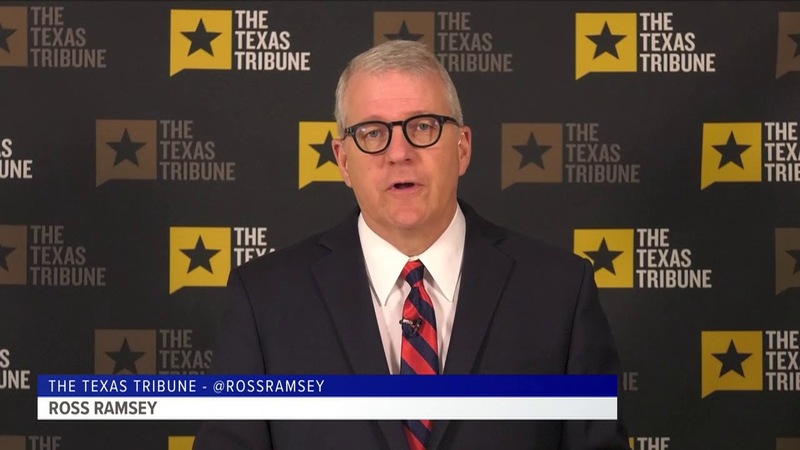 The terms sheet approved by the Austin City Council in August specified Oct. 9 as a day when either side could terminate the deal if a final agreement had not been reached. 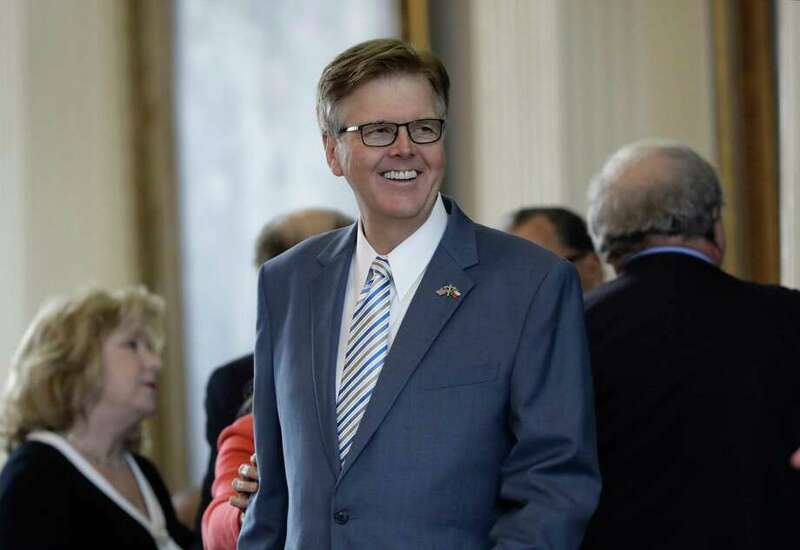 Although signatures are still likely months away, representatives from both sides told the American-Statesman that they have no intentions of backing out. "It was there as a failsafe, just in case there were any substantial roadblocks and things just weren't coming together," David Green, a spokesman for the city, told the Statesman. "It would allow either party to back out, but wasn't meant as a hard deadline. We're coming up on Oct. 9, and right now we've made very good progress. There isn't any reason for either party to consider invoking that clause of the terms sheet at this time." MLS lobbyist Richard Suttle, who works for PSV, declined to comment other than to say he agrees with the city about Oct. 9. "We always said it would take 90 to 120 days," Green said. "We're still confident in that as a good window. November, December timeframe, probably more likely to be December as both sides go through multiple reviews from their lawyers to make sure everything is above board before anybody signs anything." While both sides agree things are moving smoothly, there are still several potential stumbling blocks, starting with the lingering uncertainty surrounding the possible relocation of Columbus Crew SC. Team investor-operator Anthony Precourt, who started exploring a move in October 2017, intended to finalize a move for the 2019 season, but MLS has yet to sign off. A lawsuit hangs over proceedings in Ohio, and appears unlikely to be resolved by the end of the 2018 season. MLS normally releases its schedule for the coming year in early January, with the first games kicking off in early March. 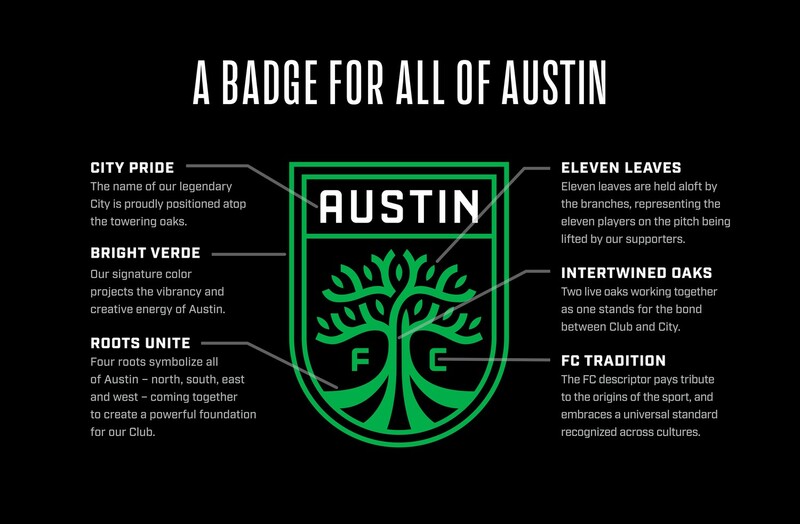 PSV had a brand reveal for a potential MLS team, to be called Austin FC, but other specifics for a possible 2019 launch (season tickets, temporary stadium, etc.) are on hold. There's also the matter of local opposition from political action committee IndyAustin, which is circulating a petition challenging the stadium deal. They're aiming for a final contract in December...but they're expecting to be able to play games in March?!? The lawsuit in Columbus remains unresolved, and will likely remain so for the foreseeable future. Speaking of lawsuits, there's one coming in Austin the deal is finalized. The only reason it hasn't happened yet is because you need a final signed contract before a plaintiff has standing. Does anyone doubt the 3rd Court of Appeals will issue a temporary injunction?!? They have to get through the petition campaign. They don't even have a temporary stadium agreement!!! Yet they want to play games in MARCH of next year. NEWSFLASH: It's already mid-October!!! It's long been rumored that the team wants to use UT's facilities as a temporary stadium. It's not a secret that UT isn't particularly interested. Given everything we know about how the University of Texas does business, just IMAGINE what UT would end up charging Precourt in a situation where they have THIS much leverage. Oh well, they're the ones who chose not to listen. Carter looks likely to survive this year. But these numbers are still soft. And there's other polling that suggests the race is much closer. As we've discussed previously, anyone who doesn't see a gigantic liability in a Presidential year is fooling themselves. The geographic vote distribution tells the story. Round Rock and Cedar Park are bad. Georgetown is still red, though not as red as it used to be. 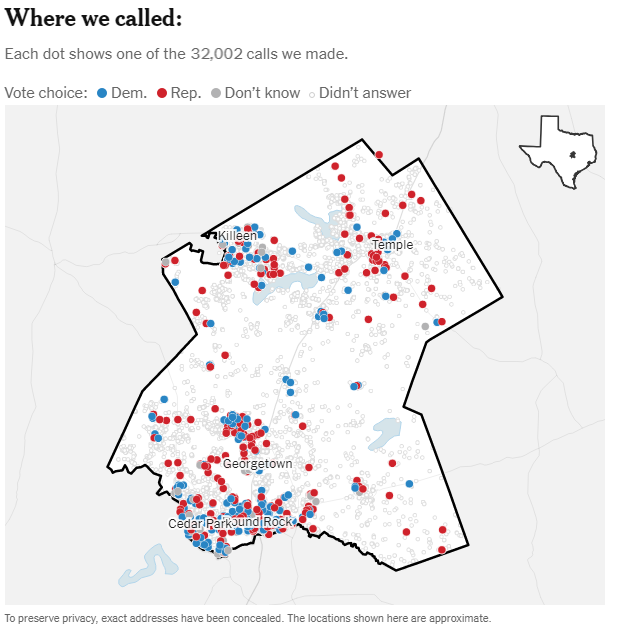 Bell County looks solid (but it's not the major population center). Bottom Line: Carter's number's are fine for this year. In a Presidential year, however, we're spooked. Consider yourselves warned. 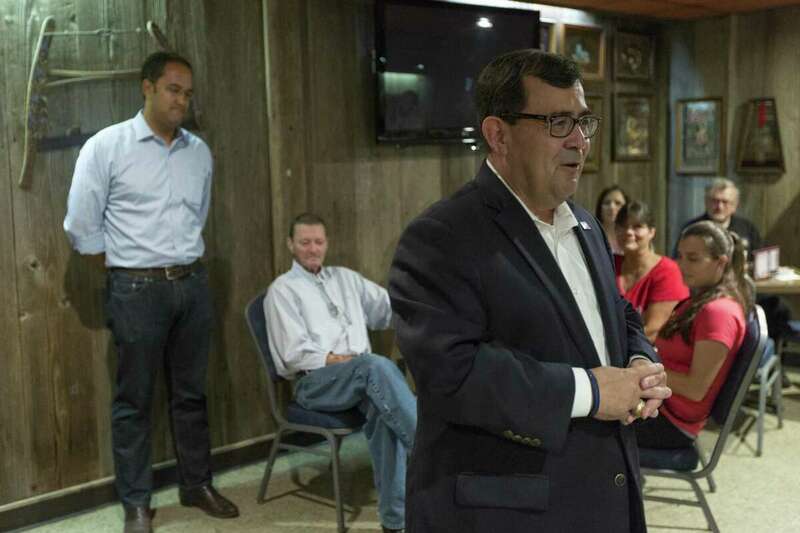 Other signs promoting Democrats from U.S. Senate candidate Beto O’Rourke to Agriculture Commissioner candidate Kim Olson were in the background. Miller’s Facebook post drew attention to Stanford and her sign, prompting countless reactions, including those that called for her to be arrested. Police did show up at her home. Some say she was told to remove the sign or it would be confiscated. City officials said police visited Stanford’s home and she asked them to take the sign, the Dallas Morning News reported. Miller posted again on Facebook that he’s happy with the result. “I’m glad that I called out this offensive campaign sign and am pleased that hundreds of others did so as well,” he said. “It’s vulgar and just plain wrong and it had no place in someone’s yard visible from the street. Obviously, we don't agree with her characterization. The Republican Party of Texas has the best record of any state-level party in the country at dealing with this garbage. Ms. Stanford might want to research the fate of former Congressman Blake Farenthold and soon-to-be former Congressman Joe Barton. 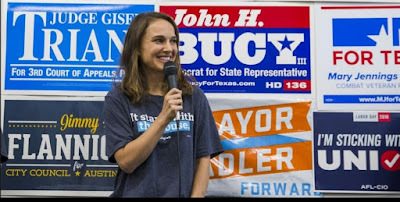 She also might want to contrast RPT's record with how the Texas Democrats have handled Carlos Uresti and Borris Miles. But, that being said, Ms. Stanford is a private citizen. Sid Miller is a statewide elected official. This is an obvious, clear-cut, case of constitutionally protected free speech. Posted a picture of a private citizen's yard to a Facebook page with over 700k followers. Lied about the content in the picture. Ginned up an angry mob against a private citizen; said mob subsequently called cops on a afore mentioned private citizen. Tried to dictate what kind of political speech private citizens can display on private property. This is outrageous. It's no different than what Maxine Waters and Sheila Jackson Lee are doing nationally. If anything, it's worse because Miller is calling for the mob to go after a private citizen. We didn't vote for him in March and, after this, we doubt we're voting for him in November. Bottom Line: Private citizens have free speech rights. Private citizens also have private property rights. Sid Miller doesn't get to direct how those rights are exercised. It almost goes without saying, but Sam Ehlinger is the primary reason the Longhorns won today's game. Three rushing touchdowns, along with two from the air, speak for themselves. Again, what a game! But here's the thing: He's been doing this all year. Under Sam Ehlinger's leadership, the Longhorn offense has become elite. It starts with the guy under center. The beautiful thing about this Longhorn offense is its balance. From the receiving corps, to the backs, to the tight ends, this offense has many ways to beat opponents. It's impossible to cover them all. But for this sort of an offense to work, you need a quarterback who makes good decisions and who has the physical skills to execute. Sam Ehlinger is showing both in spades. Then there's his running ability. Sam Ehlinger forces the defense to keep an extra defender near the line of scrimmage to defend against QB keepers. That's a defender that can no longer drop back into pass coverage. That creates opportunities. Last season, Sam Ehlinger became very predictable. That's no longer the case. Now, the only time Sam's predictable is when you know he's going to run the ball. But he's still successful almost every time! Bottom Line: We're not necessarily saying he should win. But he should be in the conversation. And, if Sam Ehlinger keeps playing the way he has been, he will be. 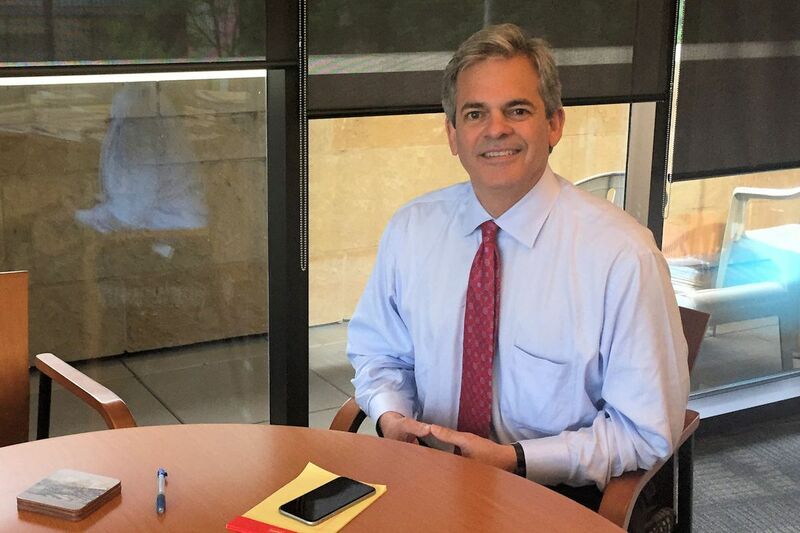 Confession: Over the past couple weeks, since George P. Bush started mucking around with the land offices' school finance obligations, this author has had quiet discussions about putting together a group effort to torpedo his candidacy in November. But that won't happen. Post-Kavanaugh, people are simply too mad at the Democrats to do them this sort of a favor. But the George P. problem isn't going away. There is, however, a solution (even if he gets a second term): Impeachment. According to Article 15 of the Texas Constitution, the power of impeachment lies with the legislature. The house has the authority to impeach statewide officers for pretty much any reason they want [Note: This power was abused a few years back]. If a simple majority in the house votes to impeach, it goes to trial in the Senate. If two-thirds of the Senators vote to convict, the office-holder is removed. Obviously, this would be a drastic step. But it might be a necessary one. 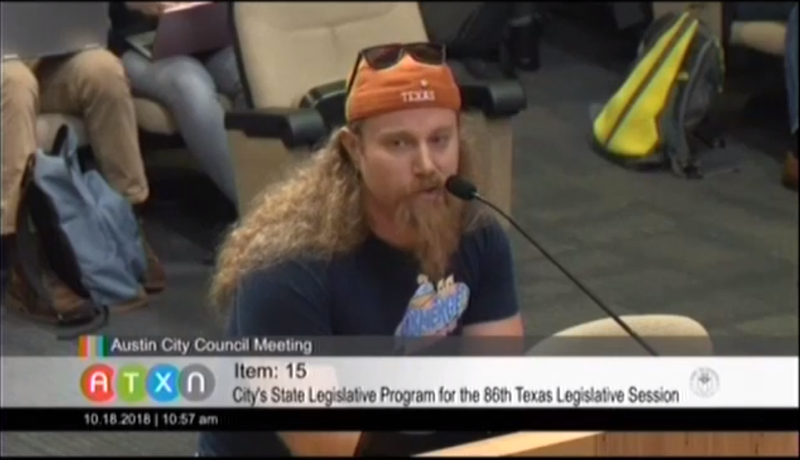 He's not backing down on this Alamo nonsense. And what he's doing with school finance is a gigantic threat to property tax reform/relief. That being said, George P. should not be impeached over transgressions committed during his first term. The voters had a chance to weigh in on that one back in March. They'll get another opportunity next month. Bush survived the first and is likely to survive the second. So his first term has been settled. But any new offenses that occur after he's sworn in for the second term are fair game. Does anyone those offenses will inevitably occur?!? 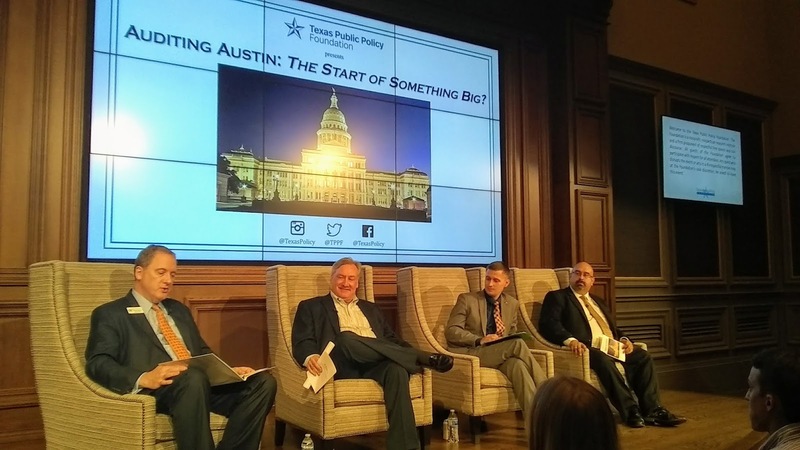 Last night, TPPF hosted a discussion about Prop. K, the independent audit on this fall's ballot. Art Martinez de Vara, the former mayor of Von Ormey, TX, spoke of his time in government. He explained how budgets are typically written by department head, not elected officials. Too often, bureaucrats control the budget process. Fred Lews, a well-know Austin activist with whom we have both agreed and disagreed over the years, supports an audit. Lewis spoke about how, in dealing with the city over the years, it's hard to avoid the conclusion that the city is poorly run. It can do better. As someone on the left, Lewis explained that "the government has to be effective" if it is to have public credibility. Speaking in opposition was council candidate Bobby Levinski. He's a former staffer to three council members and has an insider's insider resume. Levinski made the standard arguments about how an outside audit is redundant because the city has in-house auditors. He also literally accused audit supporters of wanting to kill puppies (through animal control) to beliittle the idea of government efficiency. Even if Levinski's argument were valid [Note: It's not, internal and external audits measure different things], it doesn't change the fact that sometimes having a fresh set of eyes take a look helps. People who aren't invested in a situation sometimes see things more clearly. As Martinez de Vara explained: "It's very difficult to audit yourself." To further this point, we asked Levinski a question premised a cynical hypothesis. 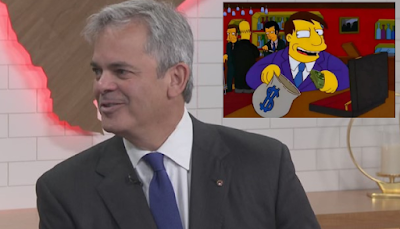 Based on our observations, we cynically hypothesize the real reason Mayor Adler opposes this with such vehemence is because his friends and cronies are getting rich off of city government (*). We asked Levinski, point blank, if he could come up with any less cynical objection to a fresh set of eyes. Levinski dodged the question with the same talking points about an independent audit being "redundant." Bottom Line: Whether your goal is lower taxes OR more city services, an independent efficiency audit has something for everyone. That's why it's widely supported across the political spectrum. That opposition only seems to come from those with a financial interest in the status quo is becoming increasingly difficult to overlook. * - We have no specific evidence, but we have A LOT of unresolved questions about the 2016 "transportation" bond, the 2017 "downtown puzzle," and the recently passed soccer stadium that an independent audit could help answer. 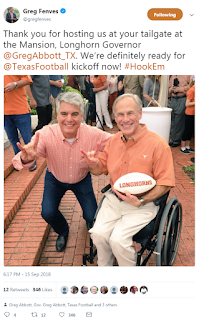 #TXLEGE: Will Abbott do anything after ANOTHER Higher Ed incident?!? Obviously, this isn't good. There's a lot that can be said. We've said a lot of it before. But it comes down to this: Abbott has jurisdiction. He's not using it. Nothing else matters. In fairness to Abbott, he's been telegraphing for awhile that he's getting sick of UT's nonsense. He forced out the Chairman of the Board last fall. But none of that has changed anything. When a lobbyist works for a corporation, a labor union, a special interest group, or even a wealthy individual, that lobbyist, and the person or group that hired them, are participating in free speech. But when the same lobbyist is working for government, the same cannot be said. Government itself does not have a right to free speech. Bottom Line: Free speech protections exist to defend citizens from the government; they don't operate in the other direction.